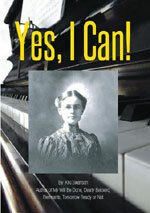 Phoebe's life story develops in the early 1900's like a song, with some repeated melodies, a few complex passages and then lyrical measures for good listening. As a piano teacher, she hears some beautiful variations, with occasional sour notes, but gradually works toward a solid, harmonic chord. Her faith keeps her in a major key, complete with grace notes. Her minister father would claim credit for her faith journey, but readers will find that her dear friends guided her and stood with her from her girlhood on, in spite of her father's harsh judment. She followed her God-given talents with patience & faith through theatening times. She shares her happy story in hopes of leading others to accept and trust the promise of God's love.